In less than a month, Charlotte, NC – city of bankers, baptists, and BBQs – will celebrate its Second Annual Vegfest! 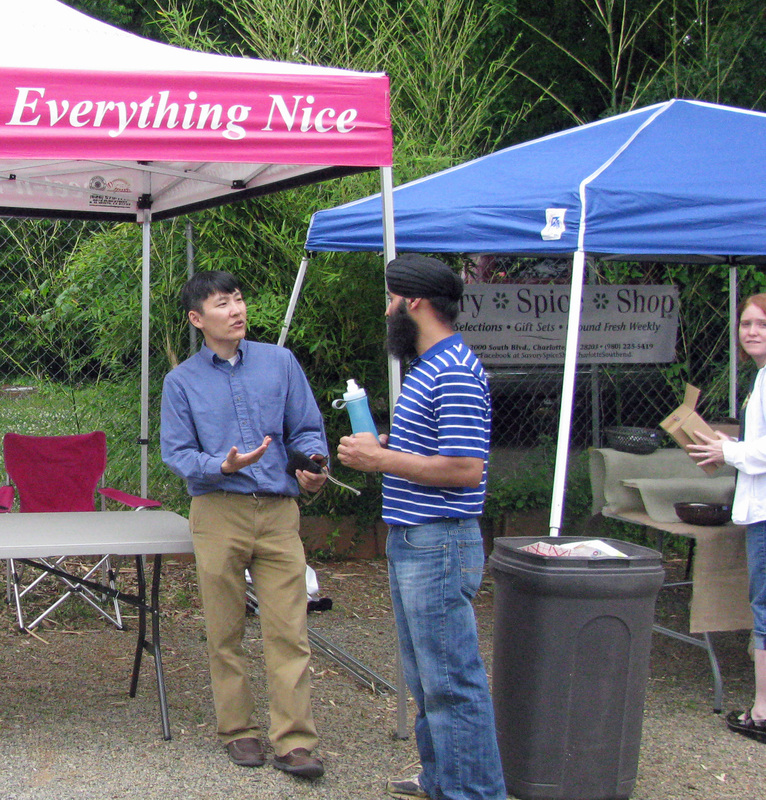 Thanks largely to the efforts of new organizer Curt Albright, Charlotte VegFest 2013 promises to be radically different from 2012. 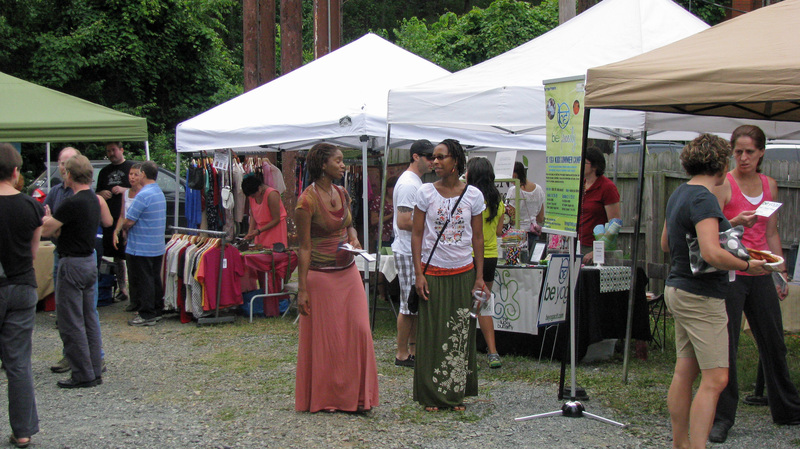 Charlotte Vegfest 2012 was held in the back parking lot of Eco-Licious; Charlotte VegFest 2013 will be held on three blocks of Commonwealth Avenue between Pecan and The Plaza. Charlotte Vegfest 2012 was all local vendors; Charlotte Vegfest 2013 will have a variety of motivational speakers, including Shabaka Amen the Vegan Trainer; Dr. Michael T. Smith homeopathy expert; and the legendary Gene Bauer of Farm Sanctuary. Charlotte VegFest 2012 ran out of food before lunchtime was over … Charlotte VegFest 2013 promises to have food galore. 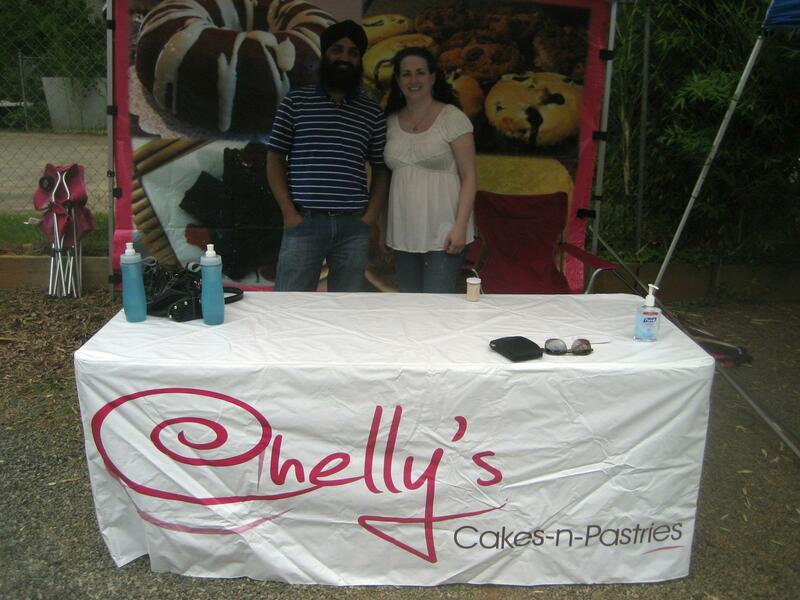 Here’s a picture of me and my partner working the booth at Chelly’s Cakes-n-Pastries. Notice there are no cakes and pastries left. They were all gone within an hour. VegFest was the brainchild of Marley Claridge (local vegan heroine) and Fiona Humphrey. 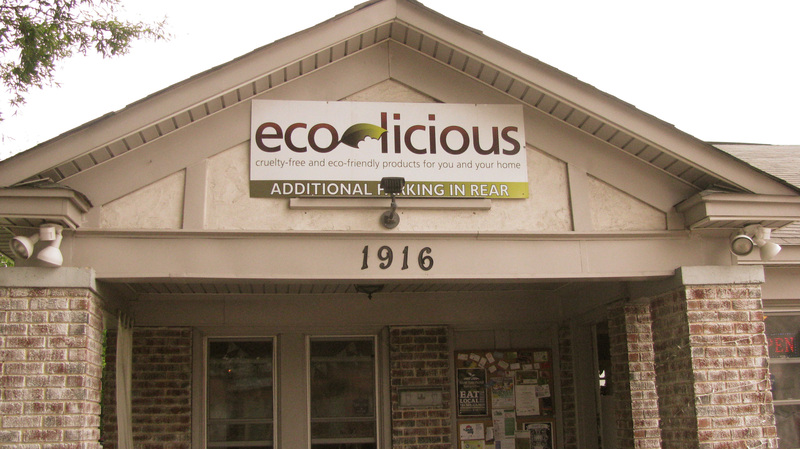 Together they are owners of Eco-Licious. I did not snap a photo of them that day, even though they are both quite attractive women deserving of paparazzi. So, here’s a picture of the front of their store. Despite hardly any advertising and being largely ignored by the press the event drew a sizeable and diverse crowd. 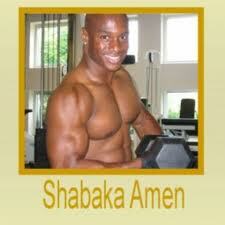 It wasn’t limited to a single race or ethnicity …. 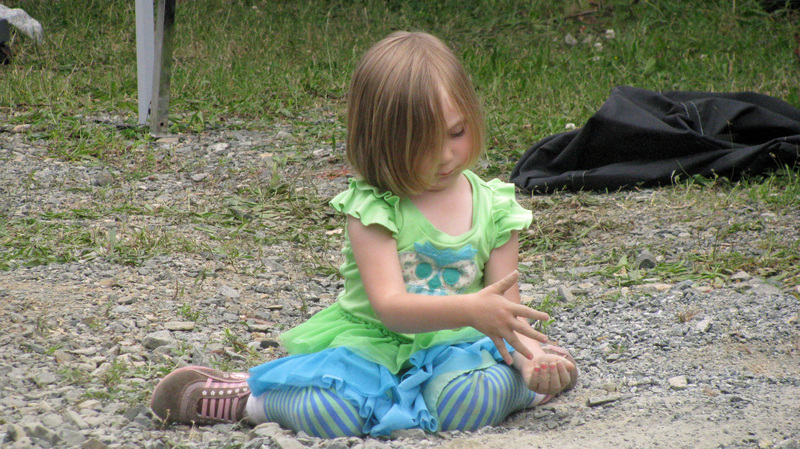 Nor was Vegfest limited to a specific age group. No, I was trying to snap a picture of Fountain of Youth Foods, who helped everyone “Eat More Kale” by providing free samples of kale chips. The crowd in front of Zizi’s. As I remember, Zizi’s was selling “chicken” salad and “chicken” parmless – two of their most popular sandwiches. I didn’t get to eat either that day because they sold out. 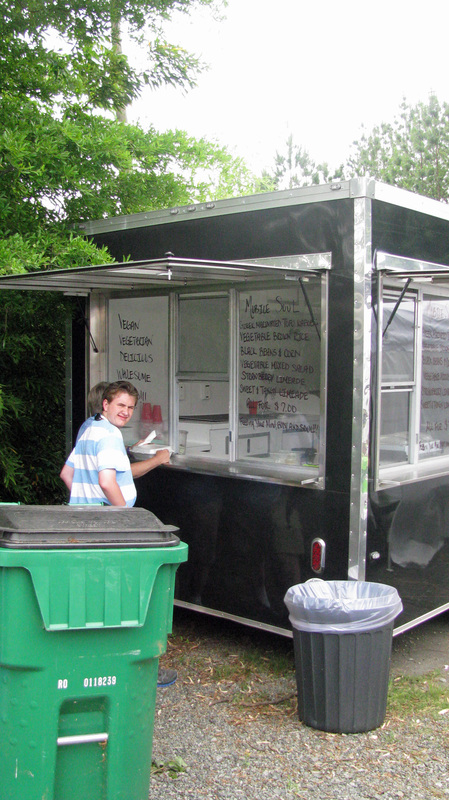 Mobile Soul, a vegan food truck vendor. They offered a plate of food – Greek marinated tofu kabobs, salad, black beans and corn, brown rice, and a choice of two limeades. The limeade was HEAVENLY. The tofu kabobs would have been better if they had actually been marinated. To be fair, the first one or two hundred they sold probably were marinated. Then they ran out of prepared food and frantically had to cook more while the hungry mob of vegans waited outside, threatening to riot. 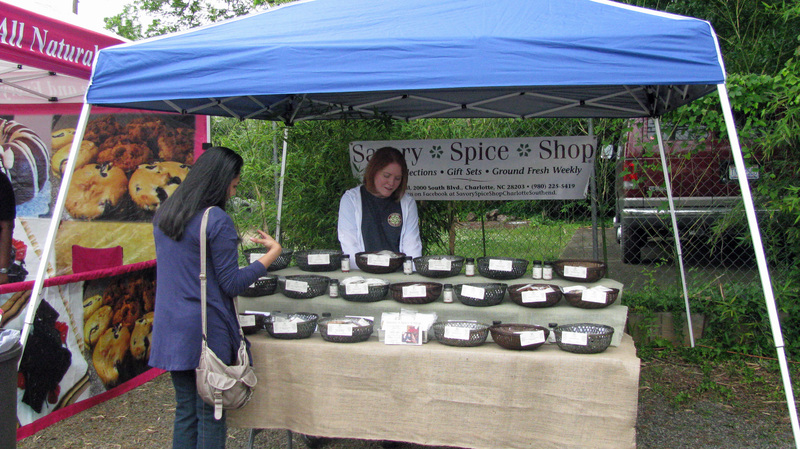 The Savory Spice Shop. An assortment of spice blends, ground fresh weekly. 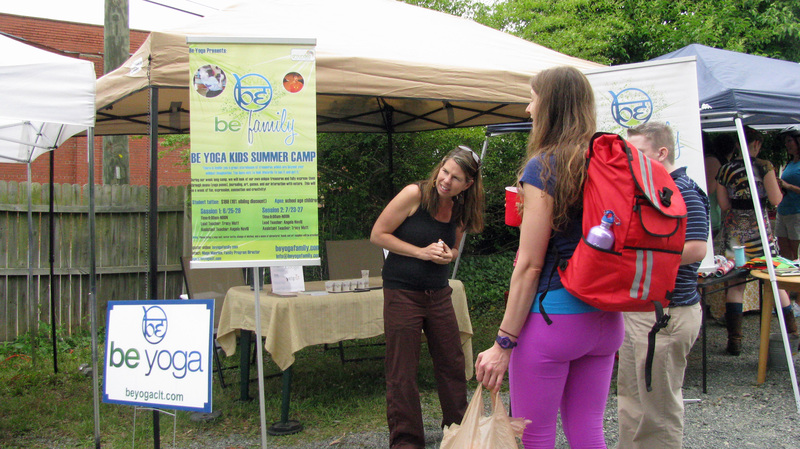 Be Yoga gave out some of the very best freebies – free passes to yoga classes! The raffle booth. Tons of great prizes (although I didn’t win any of them). Notice the woman coming down the stairs. To get to the back parking lot where the action was taking place, the easiest way was to go in the front door at Eco-Licious, walk past all their enticing wares for sale, and then exit into the parking lot via the back door. Talk about brilliant marketing. 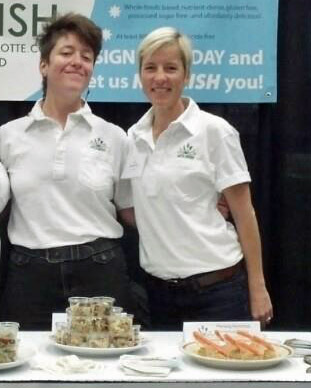 This is Julia Simon and Laura Neff from Nourish, Charlotte’s vegan meal delivery service! They are one of Charlotte’s top vegan success stories. 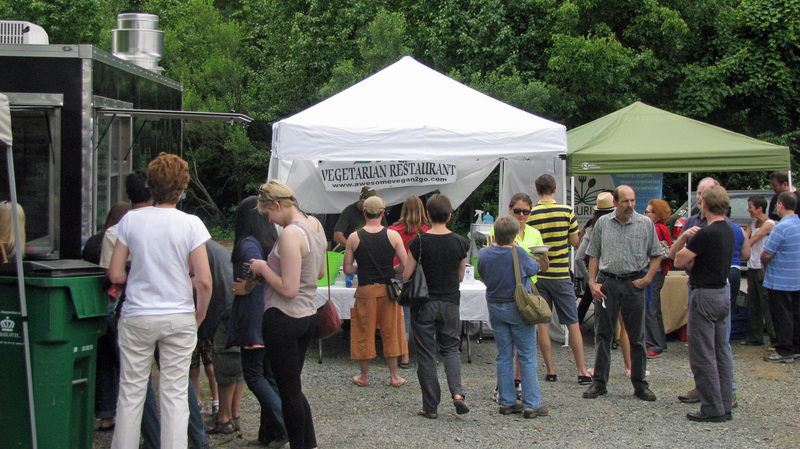 Somehow I missed snapping a pic of them at Vegfest 2012. (I did not, however, miss tasting their free samples – including the most awesome tamales!) So I stole this photo off their Facebook page. Julia and Laura are too awesome – and too cute – not to be featured in this retrospective. 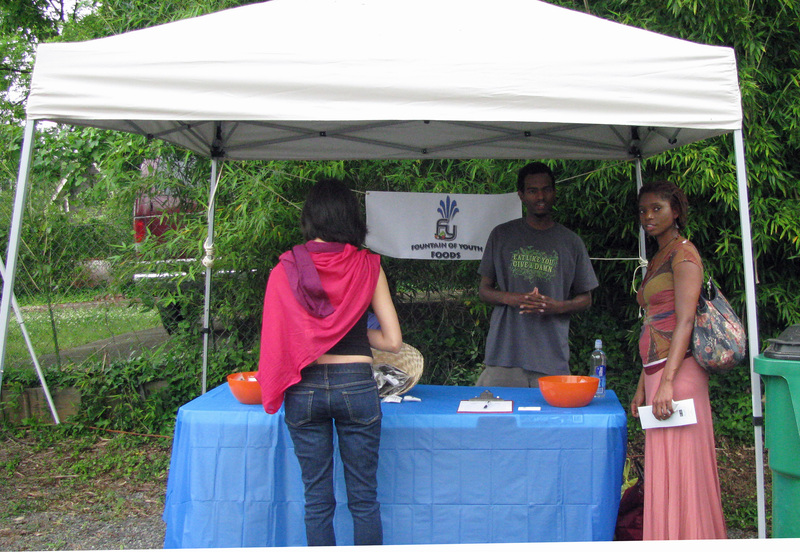 They are also sponsors of the 2013 Vegfest as well as vendors. Let’s hope they bring plenty of free samples again. 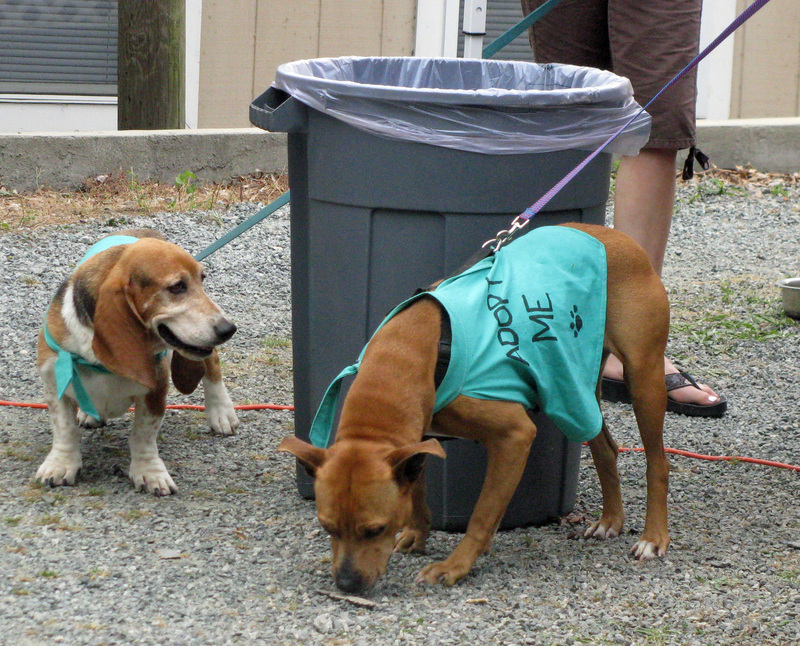 Here are some dogs that were up for adoption from the North Mecklenburg Animal Rescue. 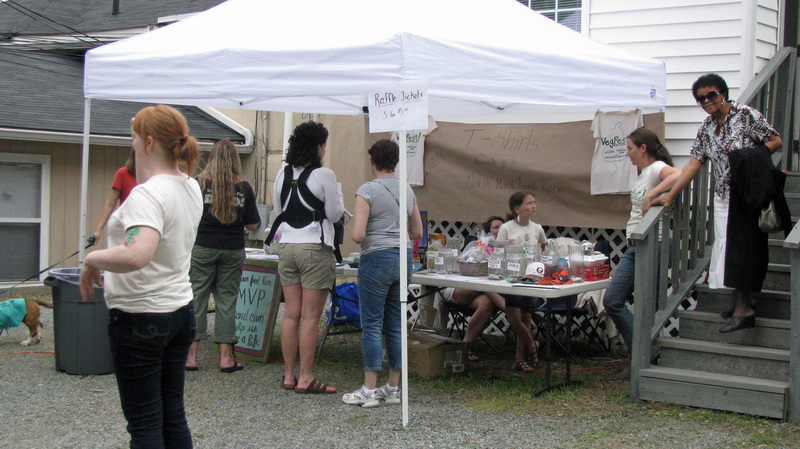 Proceeds from Charlotte VegFest 2012 went to this worthy animal charity. Hey! Maybe those dogs are the reason I keep confusing VegFest with DogFest. 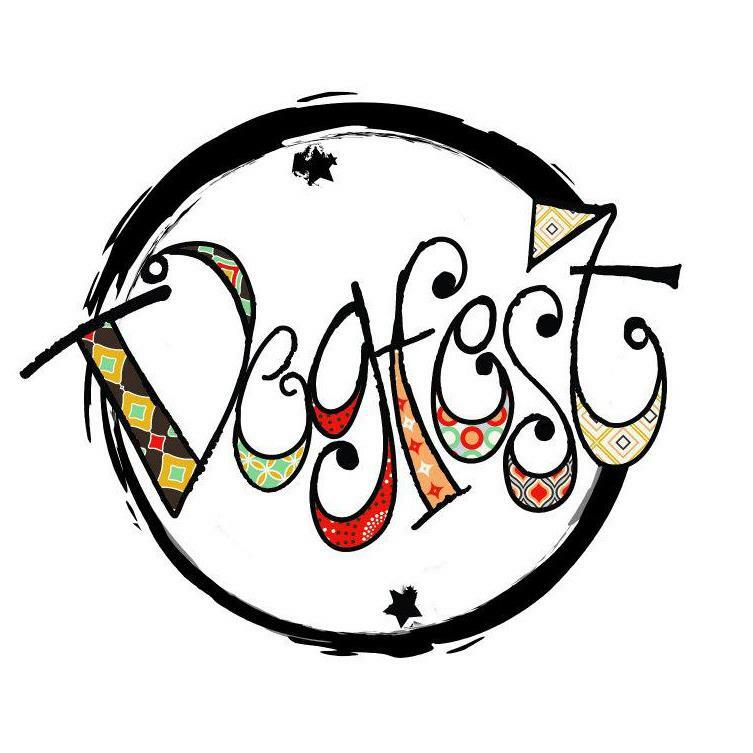 Dogfest, Vegfest … it’s all good. That is so exciting for Charlotte! It looks like last year’s went well and you learned a lot for next year. Atlanta will be celebrating our second vegfest this year too! Oh, cool! When is it? I’d love to take a little road trip! It will be Saturday, November 9th. I am putting up a short blog post about it on Wednesday.